Photographed in 1984 and 1986, the classic Santa Fe caboose still trails most trains as they roar through the scenic canyons and over the engineering marvel of Tehachapi Loop. An exciting pacing sequence follows a long freight over the Loop and into the Mojave Desert. You'll also see examples of the flashy red & yellow paint scheme that was used during the failed merger attempt by the Santa Fe and the Southern Pacific. This program captures the power and scenery of this bustling mountain division. 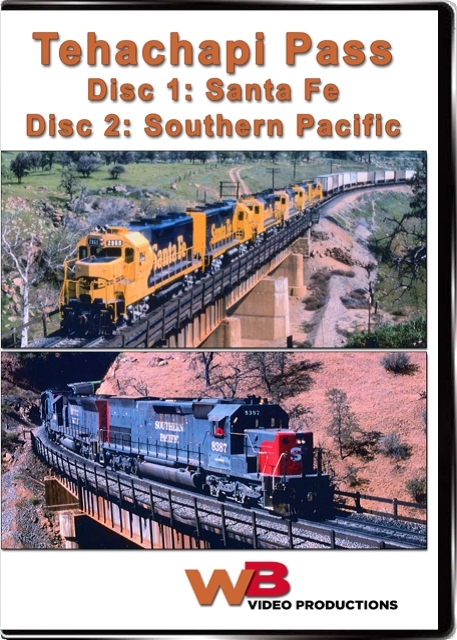 When this program was produced in 1986, The Southern Pacific still maintained its own identity even though you will see glimpses of the red & yellow merger paint scheme. It was a time when the Southern Pacific "Tank Train" still snaked over spectacular Tehachapi Loop. As an added attraction, see steamer #4449 with the 1984 passenger special...in "Daylight" colors. See it on the Loop, at a station stop and near Mojave. This is modern railroading at its best...through the green mountains of Tehachapi Pass and up onto the high Mojave Desert. Alan Jacobson (Phoenix, Arizona) on 2012-04-07 23:44:10. I have always liked this presentation and had it in VHS format long before acquiring it in DVD. Both segments take the viewer back to the time when most trains still had a caboose on the tail-end. As a former "hard-core Tehachapi fan", the biggest gripe with the programs is that whoever wrote the s did not know beans about the place-names on the mountain and various other facts. For example: The tunnels just below Cable are numbered in ASCENDING ORDER from lower elevation to higher elevation........i.e. what the narrator states as Tunnel 14 is actually Tunnel 17. Tunnels 12 and 13 were not "day-lighted" as stated in the program but are buried in-place in the mountain. Except for discrepancies like these, it is a good presentation and helps to preserve the memories of both the Southern Pacific and the Santa Fe.